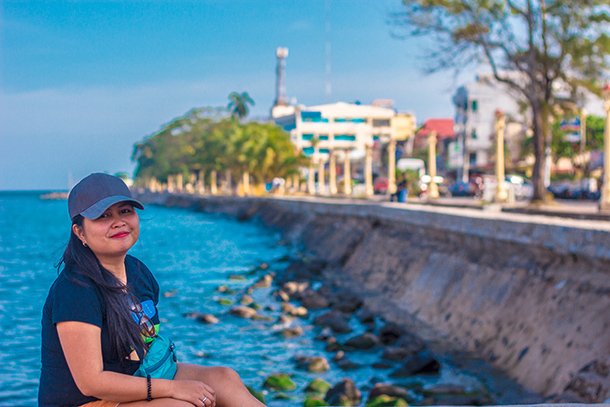 Our trip to Dumaguete was a pleasant one and very memorable. We have definitely explored so many lovely places around Negros Oriental. 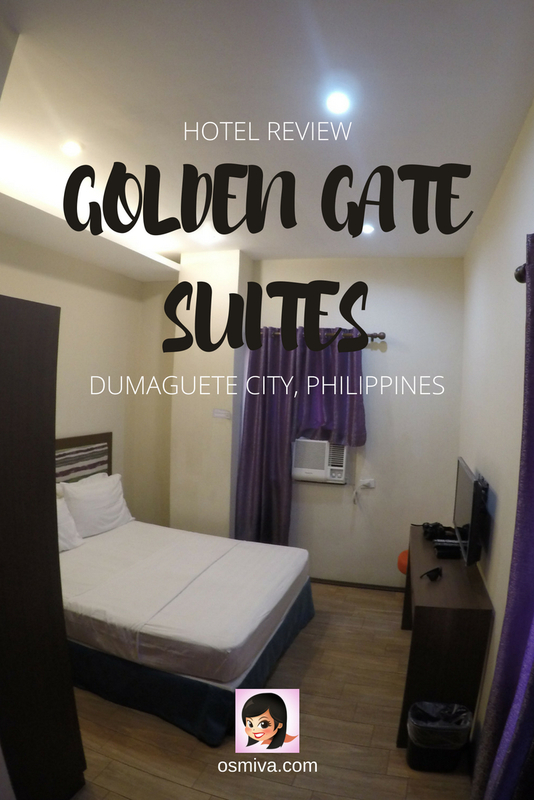 Plus, we were able to stay at a comfortable Dumaguete hotel: the Golden Gate Suites. Personally, I find that the accommodation plays an important role during my travels. It can definitely make or break your trip. It doesn’t have to be luxurious and expensive. A clean room, not too small (as I am claustrophobic at times) and with the basic necessities is enough to make me happy. These were what we experienced in Dumaguete City and I was contented. I learned about about Golden Gate Suites from several blogs I’ve read including reviews from Agoda.com. The feedback was pretty great and it was indeed one of the deciding factor of my booking a room. Booking a room at the Golden Gate Suites is very simple. You can check them out at this hotel booking site for rates. I was able to inquire about room availability through their company account in FB.. Pretty convenient huh? The staff who answered my queries was very helpful and accommodating. It made booking the room very convenient indeed and I was somehow assured that it was legit. No downpayment was required to book. Payment was made at the hotel during Check-In. Getting to the Golden Gate Suites in Dumaguete is pretty easy. Just hire a tricycle from the airport to take you there. Fare is dependent on the amount of you’ve agreed with the driver. Or if you opt for self drive and rent a motorbike from the airport, you may simply follow this map to take you. Frankly, what I love most about this Dumaguete hotel is the location. It is within the city centre and its very accessible and close to the city terminal. You can pretty much go anywhere in Negros Oriental from here. After all, Dumaguete is the gateway to Negros Oriental’s popular tourist spots including the Manjuyod Sandbar, Apo Island, the Twin Lakes and the Pulangbato Falls among others. The hotel is a bit tricky to spot. 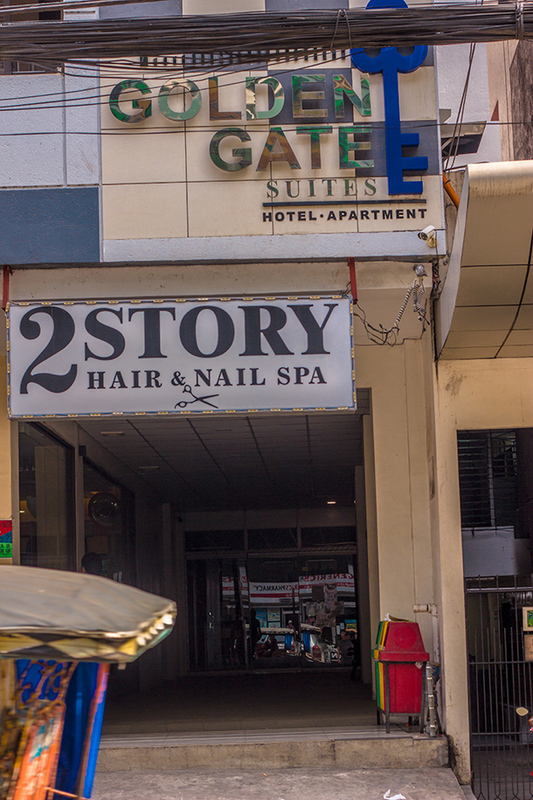 It’s located near a commercial area with plenty of Dumaguete hotels around. One of the landmarks that we used when commuting was the 7 Eleven store located at the entrance and the pharmacy (The Generics Pharmacy to be exact) in front of the building. We stayed at the Golden Gate Suites Dumaguete on our second night during our trip. We stayed at the Harolds Mansion the night before as we were scheduled to take the Apo Island Snorkelling Tour the following day. Like most hotels in Dumaguete, check in at the Golden Gate Suites was at 2PM. Our Apo Island Tour ended at around 4PM. I told the staff that we will be checking in late as we had an activity. They called us at around 5PM to confirm if we were still going to stay with them. After confirmation, they also gave us instructions to get to the hotel. We left Harolds Mansion still on our wet clothes from the snorkelling with the sea turtles. Luckily, there were several tricycles waiting for passengers in front of the Harolds Mansion and we easily hired one to take us to our second affordable Dumaguete accommodation. We paid 8 Php per person and the ride was just around 5 minutes. We were greeted by the friendly staff at the reception area. After payment for our two (2)-night stay, we were given the keys to our room. 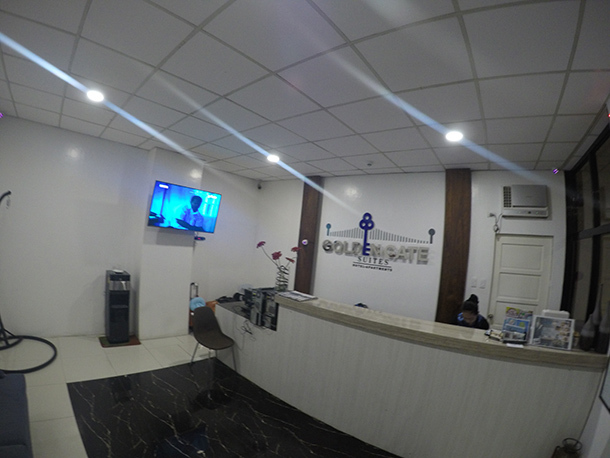 Golden Gate Suites Dumaguete has a several room options for travellers staying in the hotel. This includes a matrimonial room, a standard twin room, and a matrimonial deluxe studio to name a few. We were booked in a matrimonial room for 999 Php per night. What I loved most about the room was it was clean and well-maintained. It was equipped with the basic amenities you will need for a comfortable stay. The bathroom was stocked with soap and shampoos for use. There was hot and cold shower too as well as clean body towels and towels for the floor. The bed was comfortable with a table and a cabinet for clothes near it. Our room was also air-conditioned with a flat screened and cabled television. The hotel had no elevator so we had to take the stairs when going up to our room which was located at the 3rd floor. Good thing though as it would’ve been a struggle climbing up and down the stairs after our hike to Casaroro Falls. The hotel had no restaurant or canteen, so if you are staying here you can explore the Dumaguete food scene and try out the city’s wide variety of restaurants just like we did. Nevertheless, you can bring food with you if you want to eat inside. There are rooms with a kitchenette so if you’d rather cook you can certainly do so. Also, we were able to request a bottle of water to our room (hot and cold) free of charge. They have a water dispenser at the the reception area. If you want a refill before heading off to explore somewhere, you can easily do so here. Checking out was also smooth and easy. Our flight back to Cebu was scheduled at around 8 PM in the evening. But as we had our bags with us and check out was at 12 NN, the hotel kindly allowed us to leave our bags with them while we went to the Balinsasayao Twin Lakes. We checked out at around 11 AM and returned by 6PM. Unintentionally, we left our GoPro charger at the reception (as we had to rearrange some stuff inside the bag and completely forgotten to return some of the items inside). We have already checked in at the Airport when the call came through. After a few discussion wherein they referred some drivers to help us, my husband decided to go back to the hotel himself. Thankfully, an airport personnel who just got out of duty helped him out. 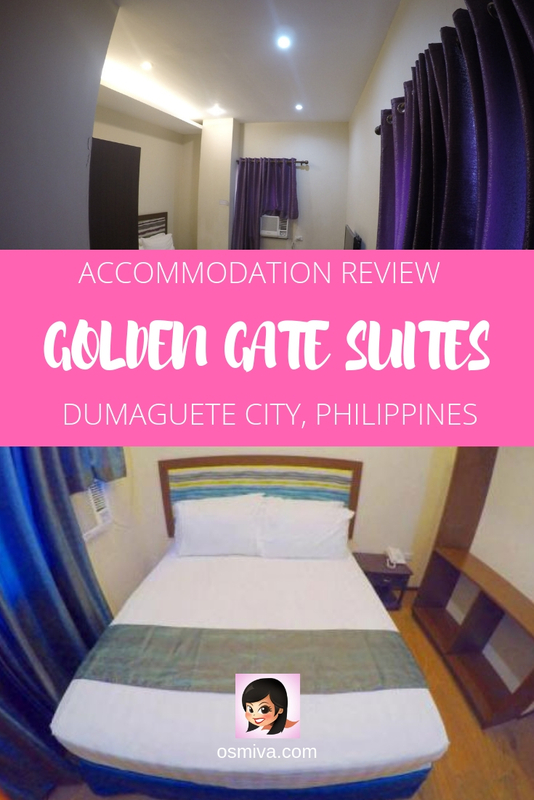 Golden Gate Suites was the perfect accommodation for us when we were in Dumaguete. It was at the city centre, the staff was accommodating and the rooms were clean and functional. Sometimes having the basics right and a good location is exactly what you need, and this sounds just like it! I am loving the looks of this hotel, so clean and modern. Loving the sound of this place (espeically the water refills) and if I am in the area one day, would seriously consider staying here. 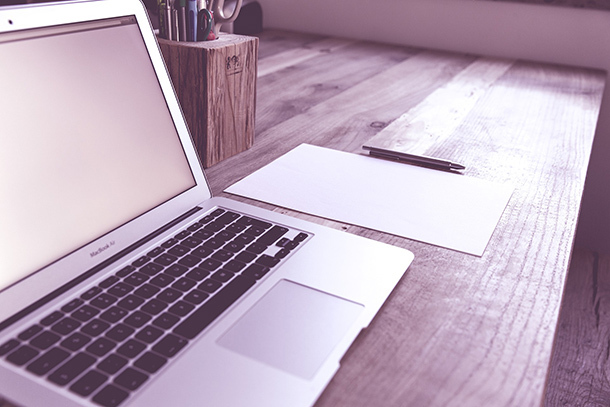 This is a really comprehensive review, thanks for sharing your experience with us! Location is everything and I love that this property is in the city center. Not loving that there isn’t an elevator though! Seems like a smooth booking process and a pretty decent hotel to live in! It’s nice to know about budget places that are centrally located and Golden Gate suites in Dumaguete seems to fit the bill. Thanks for the suggestion! Glad you found a suitable hotel for your needs! I’m a sucker for well-designed hotels and this seemed a little underwhelming to me, but if the price is good and you’re gonna spend minimal time in the room, then it’s perfect! It is one of the best review I have come across lately. True, accommodation plays very important place during travel as it refreshes you for the next day and also gives you time to align your though with the place. Good to know that staff was hospitable and address all your queries. During travel, I prefer taking food from outside my stay hotel as it gives me another chance to explore food scene of the city. Looks like a nice little hotel, but I’d most probably only book it if I were traveling solo. Location is key when I travel alone, so it’s great to learn about the Golden Gate. I’m actually thinking of heading to Negros early next year, so this comes in quite handy. Given the name I was expecting everything to be red like the Golden Gate Bridge in Cali. It does look like a really comfy hotel at a great price. I wouldn’t at all mind staying here for a few nights. Dumaguete hotel seems luxurious and modern with well appointed rooms. It also seems to be located near the sea shore. It is surprising that there are many Dumaguete hotels around 🙂 🙂 . I have been to Negros but to Bacalod side. I totally agree with you; accommodation can make or break your trip. I think it’s so important. Really informative review! A very thorough review. Looks like they provide what you need! Really nice property. I like the tricycle part! Normally I don’t think of a tricycle ride when talking about commutation from the airport!